The Arctic may appear barren and forbidding, but it is a comfortable home to a complex web of life—on land, in the water, and at the edge of the ice. Each season brings changes on which life depends. After long months of winter darkness, spring sunlight triggers microscopic growth at the ice edge. These tiny plants and animals form the base of the marine food chain. They are eaten by small fish and shellfish, which in turn are food for larger fish, diving birds, and marine mammals—including ringed seals, the polar bears' favorite prey. In springtime, young seal pups and bear cubs emerge from their dens. Beluga and bowhead whales migrate through the melting ice to their calving grounds. 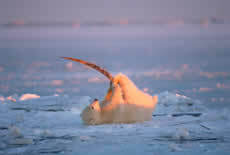 Inupiaq whalers and hunters harvest these animals, and millions of birds arrive to nest. In summer, the tundra comes alive. Grasses, shrubs, mosses, and lichens enter their brief growing season, and hundreds of flowers bloom. Caribou and muskoxen depend upon this plant life as they nurture their young on the coastal plain of the North Slope. The lands around the Arctic Ocean are covered with snow for much of the year and are permanently frozen below the surface. Only the top few feet melt in the summer; below that is solid permafrost, which neither roots nor water can penetrate. As a result, the land over the permafrost—known as the "active layer" because it melts and refreezes—becomes waterlogged. It is dotted with wetlands and lakes, and trees cannot grow. This is the habitat known as tundra. Tundra is at the northern limit of most vegetation types and receives little precipitation. Plant diversity is less here than in other parts of the world, but in the short summer growing season (50 to 60 days), life bursts forth. Arctic ponds, wetlands, and flora are essential to the large number of birds and mammals that live on the tundra for at least part of the year.